Now, in the home stretch of the semester, we are moving on to the final project. This challenge is to make your own bike computer with an Arduino. We will approach this problem as a small technology company would tackle a complex problem — by dividing it into smaller pieces and having small teams work on the different components separately. Then one team will have the job to integrate all of the components into a working system. Your first assignment for this project is to complete a short project component document describing the piece of the system you will make, and some details about it. Download this template — Component Summary — and edit it to fit your particular piece of the system. Change the text in red, and hand in a printed copy. DUE: May 17 on paper in class. Up til now, your Arduino programs have just dealt with digital output — flashing LEDs. Now it’s time to get interactive and handle digital input, from a button. For this assignment, you will implement a program that responds to button presses and then uses them as triggers to do something. You will combine this program with your binary counter from Assignment 11, and make the counter step up one number each time the button is pressed. Then you will add a second button to the circuit and have one button move the counter up and the other one move the counter down with each press. The counter will display the numbers in binary. Use the same pins for the LEDs as you did in the binary counter. 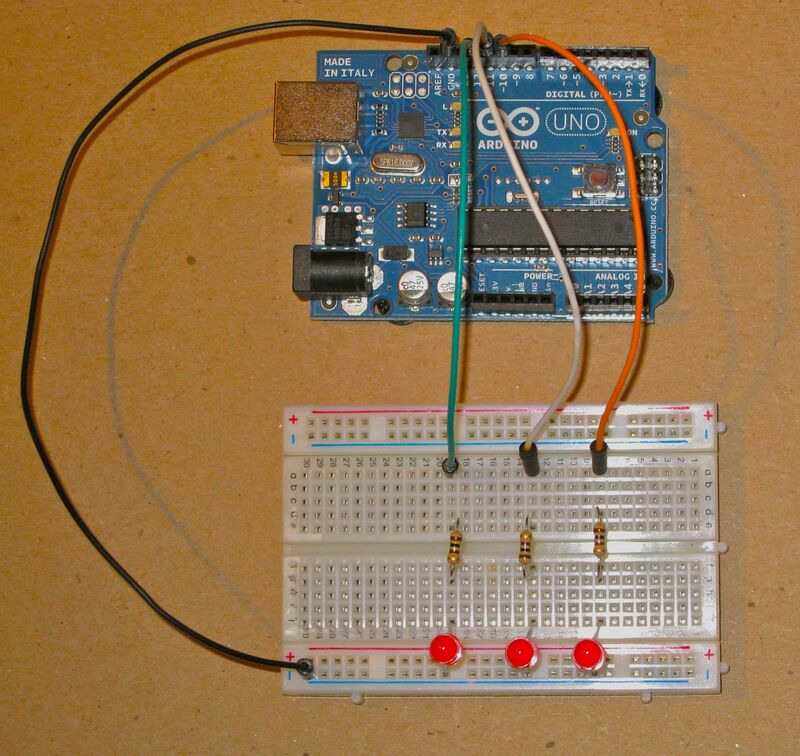 Here is a picture of how to wire the circuit on your breadboard for the button to be connected to pin 2 on the Arduino. Use a a 10K (10,000) ohm resistor. Below is an example sketch you can use if you need help getting started with this. This program simply handles detecting a button press and then flashes one LED to indicate the number of times the button has been pressed. You will have to modify it to do the logic of counting up and down as decribed above, and to display the numbers in binary. You can copy and paste this code into a new Arduino sketch, and then save it. Here is some pseudo-code for the algorithm you will have to construct to have the button presses trigger the binary counting. Remember that pseudo-code is not a literal script for the Arduino code. It is a sketch for how to think about writing your code. To grade this project, I will need to see your circuit design, and you will submit your code sketch (.PDE file) in the course dropbox. I will run it on my circuit to verify your solution. DUE: Friday, April 29 in the course dropbox. Now that you have had a chance to experiment with the Arduino hardware and software, it is time to do an assignment to make sure you can design a basic circuit and program a sketch to manipulate it. 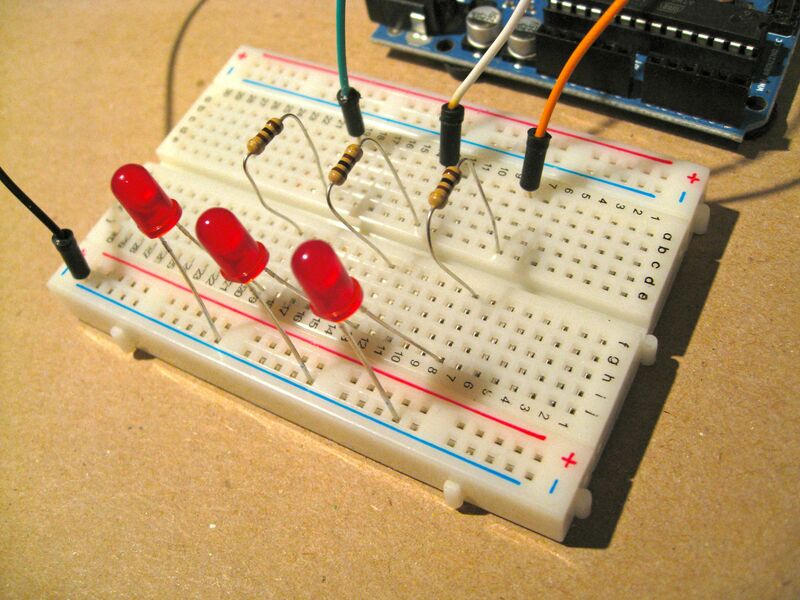 For this assignment, you will create a 3-bit binary counter using three LEDs. Your counter should display the decimal numbers from zero to seven in binary, using one LED to represent each binary digit. Create a breadboard circuit like the one in these photos (and shown in the Electronics Basics slides linked below). You can use any kind of LED. Use 220 O (ohm) resistors for each one. This is a circuit diagram that represents this design. You should get used to looking at these kinds of diagrams and working from them to build your circuit. You won’t always be provided with a photo reference; in fact, usually you won’t. Electronics Basics: presentation slides with an explanation of basic electronic circuits for Arduino. Arduino Resources: be sure to check this page for other useful Arduino references and resources. DUE: Friday, April 15 in the course dropbox. This assignment will give you practice using broadcast messages and good programming structure in a more complex, object-oriented, interactive application. Your task is to implement a basic calculator in Scratch. It will allow the user to enter digits and have the program interpret them as a number. It will simply keep a running total of the sum of all of the numbers entered. This means that whenever the “+” button is clicked, your program will add whatever number has just been entered to a running total and display the total. When a new number is entered, the display should be cleared and the user can begin entering another sequence of digits to represent the next number to be added to the running total. This may sound complicated, but you have probably used a calculator like this a lot in your life, so I hope the concept is clear. A sprite can, and probably will have more than one set of script blocks, but each set must begin with one of the blocks above. This means that sprites will typically be doing one of two things. They will either be reacting to user input (a click) and then perhaps manipulating a variable, and sending a broadcast message to another sprite to do something. Or they will be waiting to receive a broadcast message to tell them to do something (like recalculate or update the display. This document has a summary of the Basic Calculator Starter Pack’s sprites and scripts: Basic Starter Pack Summary. 0 – 9 keys: process digits as they are entered and recalculate the number being entered after each digit. Display the number on screen. You can use a “Say” or “Think” block to do this on the “Display” sprite. (You do not have to create your own digit display on the calculator. + key: stop collecting digits of the current number add the value of the current number to the running total. Clear the display and show the total, until the next digit is entered, and then begin a new number. C key: clear the current number by setting it to zero and updating the display. To see how the calculator should work in its basic form, here is a short video demo: Calculator Demo. Messages: the slides from the presentation I gave with a basic explanation of message passing. Cat Horse Demo: this Scratch program demonstrates a simple broadcast message passing application. Implement more calculator functions than the basic ones in the assignment. In the Stage backgrounds of the Starter pack program, you will find an advanced calculator version, which has subtraction, multiplication, division, sign change, and equals buttons. For a real challenge, look at the full calculator version in those backgrounds, and implement memory registers and (if you dare) real numbers with decimal points. Another enhancement would be to use sprites that look like numbers for the display instead of just a “Say” or “Think” block. DUE: Friday, April 1 in the course dropbox. This assignment will give you practice with using variables and keyboard events in Scratch. Pressing the Left and Right arrow keys should turn the sprite 90 degrees to the left or 90 degrees to the right, respectively. Pressing the Up and Down arrow keys should move the sprite forward or backward 10 steps with each press, respectively. Create a variable that keeps track of the number of moves the player makes during the game. Each time the Up or Down arrow is pressed counts as one move. The variable should be displayed om the game board so we can always see the number of moves that have been made. When the player successfully reaches the end of the maze, have the sprite announce how many moves it took to get there. Pressing the space key should reset the game to its initial state: move the sprite to the initial position, reset the number of moves to zero, etc. Pressing the green flag should start the game, which should do everything that the Space key does. It should also have the sprite announce the beginning of a new game. Use this image for the maze: Maze Background. You can download this image, and then import it into your Scratch program as a background for the Stage. Feel free to use a different image, or make your own, as long as it is as least as complex as this one. Variables: the slides from the presentation I gave with a basic explanation of variables. Variable Demo: this Scratch program demonstrates the basic use of a variable. It also shows how to respond to a number of different keyboard events to make things interactive, as well as how to use various operators to do calculations and manipulations of variables. Conditionals: the slides from the presentation I gave with a basic explanation of conditionals. Conditional Demo: this Scratch program demonstrates the basic use of a conditional statement. From studying the demo, you should be able to implement the game as described above. But, of course, this isn’t really a maze-following game, because the player could just ignore the walls of the maze and head right for the exit. Do not let the sprite run over any walls. Make sure it checks to see if there is room to go in the direction it is headed without hitting the wall. If not, just ignore the Up or Down arrow move command, but still count it as a move! If the sprite reaches the end of the maze, make a little fanfare if it took less than 50 moves to do it. If the sprite takes more than 100 moves and still has not reached the end of the maze, let the player know and end the game with some obnoxious sound or action. Think up some other fun things to add to the game. DUE: Friday, March 25 in the course dropbox. This assignment will give you practice with drawing in Scratch, using coordinate systems, animation, and a chance to use some math and creativity. You will also have to analyze a problem and break it down into smaller component tasks, and use pseudo-code to document it. The documentation of this project is an important part of the process, almost as much as writing the software. Your task is to design and program an animation in Scratch that illustrates the mathematical construction known as the Golden Section (or the Golden Mean, or the Golden Rectangle). In class, I demonstrated the geometrical construction of the Golden Section. This image is a snapshot of that algorithm. Your program should illustrate the steps of the construction, not just show the final result. You should first analyze this construction and break down the animation into smaller tasks. For instance, if you have to draw four rectangles in total, then think about how you will draw those four individual rectangles and how they relate to each other. First produce a step-by-step sketch of the geometric construction algorithm. Then write out the pseudo-code for that algorithm. Then you can implement it in Scratch. Here is a sample of what I am looking for in an algorithm description (sketch and pseudo-code): N-gon Draw. This is for the “N-gon Draw” program below. Yours does not have to include your Scratch code; the pseudo-code is the most important part. You are free to exercise your own creativity in designing this animation, and encouraged to come up with a good educational, visual explanation of the Golden Section. It should show the basic geometry of the ratio and demonstrate the graphical relationship involved. (You do not have to illustrate the recursive nature of the rectangle. We’ll save that for later.) Here is the slide set I showed in class explaining the rectangle’s spiral magic: Golden Section. 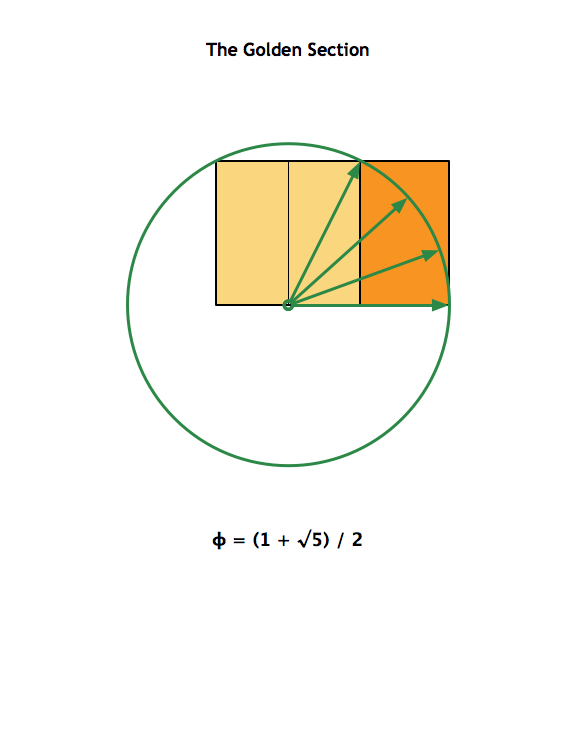 Finally, add a background image of an example of a Golden Rectangle from nature or architecture, and draw your Golden Rectangle at the right location and size to overlay the rectangle on the background image. DUE: Thursday, March 17 in the course dropbox. This is just a check that you have been keeping notes and required entries up to date in your course journal or notebook. DUE: Monday, February 28 check in class. OK, at last you start programming. Or “scratching,” as they say. Your first Scratch assignment is to make a simple animation using the letters in your name. The animation can be anything you like — be creative! This programming stuff is supposed to be fun. Use a separate sprite for each letter of your name and have each letter do something when the green flag is clicked. Each sprite should have a script that uses the “forever” block. Beyond that, go crazy and experiment a lot with as many blocks as you can find. Use the resources to poke around and try things. Here are two sample Scratch name programs you can look at for ideas. One is from another curriculum, and the other is one I made of my name. You can download them here to see how they work, and use them for ideas and techniques for your own animation. DUE: Monday, February 28 for a demo in class. NY Times Magazine article: What Is I.B.M.’s Watson? WIRED Magazine article: What’s It Mean to Be Human, Anyway? Who was Alan Turing and what is the Turing Test? What does it mean to be “human,” especially in conversation? Name at least three factors that make the Jeopardy! challenge difficult for a computer, and for each factor explain why. How does Watson work? Describe at least three principles of its design. Why is a system like Watson, which can answer general natural language questions, a much more significant achievement than creating a search engine like Google? Explain why both serious computational power and finely tuned algorithms are necessary for Watson. Watson is considered the latest “Grand Challenge” in science and engineering. What constitutes a “Grand Challenge,” and name at least three previous ones that have been achieved. What might be the next one? What are some of the moral, ethical, and societal implications of Watson, assuming this technology makes its way into the mainstream at some point in the near future? DUE: Friday, February 18 on paper in class. Why is this kind of problem (the handshake counting) important? Where might that kind of problem come up in the world? How could your solution be used in other domains (e.g., carpentry, cooking, fashion) ? (extra) Graph the solution to the handshake problem: y = x(x-1)/2. Prove, mathematically, that ? [n + (n-1) + (n-2) … 1] = n(n-1)/2. DUE: Thursday, February 10 on paper in class. DUE: Tuesday, February 8 on paper in class. To give you some insight into what the field of computer science is all about, in a research context. To give me an idea of what projects you think are most interesting so that I can try to arrange guest speakers to come to our class and talk to us about the work. DUE: Monday, February 7 on paper in class. Why did you take this course? What do you hope to gain from it? What is your definition of computer science? What do you think the field covers? DUE: Tuesday, February 1 in class. Please fill out an online survey with some information about yourself for me. You can find a link to the survey in the menu above on this site: Info | Student Info Survey. DUE: Tuesday, February 1 online.